Chihuahuas are very popular dogs, but unfortunately what are also popular are obese Chihuahuas. Some people even think that obesity in these dogs is funny or cute and they poke fun at them. Most people do not even know the danger that is caused by a Chihuahua being overweight. The owners just brush the issue off like it is no big deal. Well, it is time to learn that it is a big deal. You are putting your loved one in serious danger. Find out how you can fix this problem and prevent future issues. 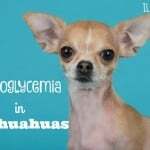 Obesity in Chihuahuas can cause heart disease, diabetes, wearing down of the joints, arthritis, and a shorter lifetime so it is time to get serious about your Chi’s life. Whether your Chihuahua is just overweight or has become obese, they are in trouble. 40% of all dogs in the United States are overweight. This should tell you something right there. Their owners are neglecting their best friend’s health. Do not be one of them anymore! Most Chihuahuas should weigh less 6 pounds or less. (The exception to this is if your dog has a larger frame than the standard Chihuahua, and your vet can tell you what your Chi should weigh.) So in order to find out of if your pup is overweight, all you have to do is weigh them. If they are over 6 pounds, they probably have a weight problem. Another way to tell is to feel their ribs. You should easily be able to feel them under their skin. If you can’t, they may have a weight problem. Do not panic, though. All you have to do is fix the problem before it is too late. Besides the main health issues stated above, here are some additional effects that can arise from your Chihuahua being overweight or obese. Arthritis due to the extra weight putting pressure on their joints and bones. Type II Diabetes due to their bodies needing more insulin. If Chihuahuas end up with Diabetes, they may need an insulin injection every day or their body will go into shock. Back and spinal problems due to their little body not being able to handle the weight. Their spinal discs can slip, bones can fracture, and ligaments can tear. The greatest risk for an overweight Chi is heart disease. If they have Patella Luxation (loose knee caps), being overweight will aggravate and worsen the condition. 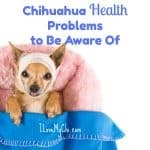 In order to prevent any of these nasty issues for your poor Chihuahua, there are some things you will need to change, as their fur mom or dad. If you feed your Chi table food, stop right now! They don’t need the extra food. Now if you have some basic meat and veggies for dinner, it’s fine to add a little of that to your dog’s food. Just make sure they are still getting the same quantity of food that they normally would. Even if they are begging, you need to use self-control to care for their health. 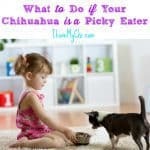 When it comes to dog food, depending on how much you are currently feeding your Chihuahua, cut down to once or twice a day. No more than twice! As for how much, feed them between 1/4 cup and 1 cup a day. Do feed them a high quality dog food, preferably one with no grains. Increasing your Chi’s daily activity level and making them exercise will definitely help them lose weight. Despite the Chihuahua’s small size, they actually do need to run around and play every day even if they are not overweight. If you don’t give this to them, they actually will naturally gain weight even if you are not feeding them excessively. Allow your Chi to exercise by creating fun games for them that will increase their activity level. Let them run around the yard with toys. On cold days, you can make up fun indoor dog games, like bouncing a small ball and encouraging them to fetch it. Anything that you can come up with will help your pup lose weight. Do not let your overweight Chi overdo exercising because this could also be harmful. Take it slow at first and then gradually increase the activities more and more. Is your Chihuahua overweight? Or have you had success in helping your Chi lose weight? Leave a comment and tell us about it! Great advice! Chubby isn’t cute; it can be very unhealthy. My chihuahua Diego is overweight I’m working on him to lose weight by making sure I take him on walks everyday.,I did ask my vet how much he should weigh and they told me between 8 to 10 pounds because he’s about the size of a cat he’s not a small Chihuahua and thank you for the info it was very helpful. I’v been told I have to put mine on a diet. She weigh’s 4 but vet said she should be 3.5. We are getting there but it is hard. She had her knee done a year ago so she had to rest. Now we can hopefully get her to how she once was. Wow, 3.5 is really small. She must have a tiny frame Sarah. I have a 3.5 lb chihuahua. I use Weight Watchers measuring spoons for him. He gets 1 tsp. 4 times daily with training treats – Food & treats are no grain Natural Balance Salmon. My 5 lb boys get 1 tbsp 4 times daily with fewer treats. They get exercise, but they are all lap dogs!! The vet says they are in great shape. We work at it. But they are my children. Sounds like you are a good momma to them Susan. You are a wonderful dog mother, Sarah! I actually have 5 little dogs (4 Chi’s & 1 wild mix). I make sure they get good exercise, but whenever I sit down, I am covered in all the Chi’s, and sometimes a cat, too. I love it! I have two Chi’s and one is overweight. He should weigh 6lbs and he weighs 10lbs :/ I walk him everyday and he only gets 1/2 cup of food twice a day (Only the “Blue” brand food). I do not give either one of them human food. He didn’t get fat until we had him fixed and then we caught him always eating what the other one was leaving in his bowl. We put an end to that but we just can’t seem to help him loose the weight. Any suggestions would be great. Tina, you may be overfeeding him. For a dog who should weight 6 pounds, he probably should only be getting 1/2 cup total so that would be 1/4 cup twice a day instead of 1/2 cup twice a day. I have trouble keeping my Chi out of the other dog’s food too. She tries to bully them into letting her have it and they are 10 times her size. I too have an overweight Chi. I quite giving her any scraps and nibbles. I make her dog food with boiled turkey roll, hard boiled egg and either sweet potato, pumpkin, applesauce or green beans, carrots and some spinach. I puree whatever I am adding so she gets all the nutrition. I also add a little dry dog food (Wellness Healthy Weight). I am going to cute down to 1/4 cup twice a day. I think I may have been giving a little to much. Is there anything in the food I should maybe take out?? I don’t think so Debbie. All the ingredients are quite healthy. Just cut down how much you are feeding her. Also, as soon as I spayed my two smallest female Chi’s, they immediately put on weight. That’s definitely an issue. Yeah it does seem that spaying sometimes make them put on weight. You should cut that down he should only get half a cup a day not half a cup twice a day, check with your vet. I did say between 1/4 c and 1 c a day. It depends on the age, size and activity level of the dog. Silly question, but have you asked your vet about this? Dogs that have problems losing weight may have an underlying health issue. I have 4 dogs and NEVER overfeed them; table scraps are a no-no in my house; yet I had one, my Lab/chow mix, who was getting chubby anyway. Turns out he has a thyroid issue. That is actually very, very common in dogs (I actually work for the vet, and we see hypothyroidism all the time). We put him on levothyroxine and a weight-management food and he slimmed right down. So don’t forget to involve your vet in the weight management of your dog, if simple diet/exercise changes are not having an effect. I feel ya there Love Joy! If family members won’t cooperate, it’s hard to get their weight down. I got some tiny treats that Kilo loves but they are only 5 calories each and I put them in the treat jar so when people feel like they have to give her a treat, at least they are giving her a low calorie high protein one. They are called Mini-Rewards from Natural Balance. Can you get him to exercise more? Like taking walks and playing games? Thanks for the info. the vet said my chi is 5 pds. overweight, he should be approx.10 pds b/c he’s a Jack Russell/Chi mix. He runs and plays around the house, and treats are cut back to almost non existent, given every other 2-3 days(basically once/twice every other week).But I will have to stop the green vegetables, salad greens(people food) that he enjoys so much and just keep him on his dog food. Yeah that’s a tough one Lynda. Until he loses some weight and his legs feel better, he’s not going to exercise. Will he go for a walk with you? Maybe if you can take him somewhere interesting like near a pond or somewhere where he would want to explore. Also those table scraps have to stop. Tell your family they are killing him with kindness. They aren’t doing him any favors by feeding him. Also, how much food are you giving him? You may need to cut back some. My chi is over weight The vet told me to add string beans to her food because she was staying hungry I prefer fresh ones but do they need to be cooked? Not necessarily Shirley but sometimes raw ones make them gassy. You can try them raw and see how your dog does with them and if need be, cook them next time. I have a overweight Chi Chi and I’m havening a hard time getting the weight off. Were I stay I can’t let her out side so were inside mostly. I don’t want to lose her. Being inactive is why I feel my dog is fat. Since she is inactive, make sure you aren’t over feeding her. I adopted an obese chi from the humane society and she gets limited dry dog food and she is morbidly obese. I don’t know what to do with her any more. She gets nothing extra except a chew bone once weekly. Her diet is royal breed specific. Is she getting any exercise Denise? How much are you feeding her? You may need to switch to a weight control dog food. My beans was very fat….couldnt get his weight down….then i started making his food….in weekly batches, i put a chicken breast, 1/2 c cranberries, 2 carrots, 3 stalks of celery, 1/2c baby spinach or brocoli….wiz those things up in food processor….add 1/2c red quinoa, and 1 c brown rice….cook everything together with water about 1 hour….he gets 3 tbls in am and at nite he gets 3 tbls….he is now nice and svelte, and healthy…..only took 4 mos for my baby to get healthy again…? Great idea Cheryl! Thanks for sharing! I just switched out Chi’s diets to Blue grain free, wet food. I am feeding 1/4 of the can twice a day. I am going to try playing indoors with them as well. They currently do not walk on leashes…We will have to work on that. It seems while we are at work they just lay in their beds with their shows on the t.v. I really like the idea of making the food for them…I find your homemade recipe fascinating so I may give that a try if I don’t see results soon with the Blue! Out of all the pages I have been researching, I feel this one gives the most concise directions. Thank you. I didn’t realize how much weight they were gaining, I feel like a bad Chi mom and all I was trying to do was spoil them. I have to remember that food does not equate to love! I need them healthy to live a long and happy life! Don’t feel bad Laura. I fell into the same trap. It’s so easy to overfeed them. If you want to get them used to being on a leash, put it on them while in the house and just let them walk around with it for 20 minutes or so til they seem comfortable wearing it. Just be sure to supervise them while doing this so you can make sure they don’t get the leash caught up on something. Let us know how it works for you Laura. It always disturbs me to see people with obese dogs, no matter what breed! I measure out what I feed my 2 Chi’s (one small – 7 yrs old, the other larger – almost 3 yrs) every time I feed them. My husband tends to share when he’s snacking, but I try to monitor that, and so far it must not have been excessive. We walk them at least 3 times a day, weather permitting, and play inside with them regularly, even if just for brief intervals. Taking these steps for our “granddoggers”, so far our girls don’t appear overweight …. and we’d like to keep it that way! It sounds like you are doing all the right things Ruth! My baby is a grand old 16 years young….he is almost blind, and completely deaf….I can’t let him outside….too many coyotes….so we exercise in house….I had him trained as my service dog… I am in a wheelchair….he does his job….and won’t quit….I am a lucky momma…. He sounds like a great little Chi Cheryl. I have a chihuahua / pug mix and I don’t know how much is supposed to weigh. She weighs 16.6 pounds now and I really want her to be healthy. Can someone let me know what the ideal weight should be. Thank you. That’s probably something your vet will have to tell you since she is a mix. I can tell you that a Chihuahua should weight 6 pounds or less and a pug should weight between 14 to 18 pounds. Hey all, I have three chi’s and none of them are overweight, my method is free feeding them, they eat when they are hungry not when I give them food.. And I do give them the odd scraps here and there. One of them is 13 years old and she’s under 6 pounds.. My boy is 4 years old and he too is under 6 pounds, and my third one is a year old and she too is under the 6 pounds. Again, I free feed them, it’s unfair to them to give set feedings, you eat when your hungry so why can’t they? I’m sorry, but my guys aren’t over weight and they go to their regular vet visits. They are smaller than cats. That doesn’t always work Lisa. I have always free-fed my dogs and once Kilo came to us, she started putting on weight, mainly because she was helping herself to the food that was always out way too often. A year ago I had to put our Chihuahua on a diet food because he was overweight at 8 1/2 pounds. After six months he was down to 6 1/2 pounds. I gave him 1/4 c. of prescription diet food twice a day, along with carrots or green beans for a snack. Then we changed him to another dry food that we were told was a good food to keep the weight down. I fed him the same amount of that food daily. Last month, when I took him to the vet, he weighed 9 1/2 pounds. That vet told me to give him no more than 150 calories per day. My question is, how can I tell how many calories are in food when it is not listed on the package? Any advice you can give me would be greatly appreciated. To tell you the truth, I can’t remember the brand. My daughter bought it from a farmer in Ohio who supposedly makes it and it is supposed to be organic. My daughter’s dog stays at a good weight for him but he is a big dog, an English Springer Spaniel. The farmer told her that it is good for any dog. She brought it to me in a big plastic tote. I have looked in the stores at all kinds of food and can never see a calorie chart for how many calories are in a quarter or half cup. He is just about out of this food and I am either going to go back to the Hills Healthy Diet or some other, but none of it tells how many calories are in it. That is why I am having a hard time putting him on a calorie counting diet. 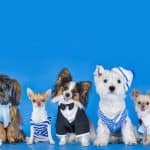 I read here: https://www.petfinder.com/dogs/dog-nutrition/dry-dog-food-calorie-count/ that most dry dog food has about 97 calories per ounce. Of course a weight loss dog food would be a bit less. When you decide what food you want to feed them, use google and search for: calories in (whatever brand you are using) and see what comes up. If nothing else, it should lead you to the company’s website where you can get their contact info and ask them. You can often find their Contact page at the bottom of their website. My chi joey weighs about 8lbs and he’s supposed to weigh 5lbs, I got him fixed and he immediately gained weight. Is that normal? It’s hard to exercise him because my step mom has a big dog that wants to hurt him so I have to lock up the big dog to let joey outside and can’t leave him out alone we have wild animals out here. Also trying to play inside the only place to play is in my room. no room at all. Taking for walks is out because Noone puts their dogs on chains or behind fences so they try to attack when you walk by. I don’t know what to do? He’s aggressive with other dogs so the dog parks are out too. I feed him blue buffalo weight management food. What can I do? ??? How much are you feeding him Lillian? Hi, I just wanted to send a pic of my Porsha that looks very much like your baby. Thank you so much! I think Porsha looks like Lillian’s little Joey in the pic above. She is 6 years old, and also is overweight but we are working on it. The other baby is Lexi and she is 8 months old. He eats 2x per day, about 1/4 cup each time approximately no more than that. Try cutting the amount down. Keep the morning meal at 1/4 cup but drop the evening meal to 1/8 cup and see if that helps. See if you can add at least 15 minutes playtime a day with him too. You’re welcome Lillian, keep us updated. 2x a say. But he does get treats and i put homemade chicken ontop of his food. The food amount sounds right Karen but how much chicken are you adding? I’d cut back on the treats too. Is she getting at least a quarter of a cup of food a day April? If so, she’s probably okay. It takes awhile to get over a surgery sometimes, and specially the anesthesia can mess with the appetite. If she is active, that’s a good sign too. If you notice she’s just lethargic and tired all the time and is getting too skinny, then it’s time to contact your vet. I have just the opposite problem with my rescue Chihuahua. I can’t get him to gain weight. He weighs 3.4 pounds. But he looks skinny to the point of his back bone and hips protrude. I have taken him to 3 different vet, had blood work done and they all say his bloodwork is fine. I thought maybe he had a liver shunt and that was causing the problem and the vets said no. I am so frustrated…He literally doesn’t want to eat. I have tried steak, dry dog food, canned dog food, chicken, turkey, scrambled eggs, lamb you name it and it seems like I have tried it. BUT…if you open a pink taffy, receese peanut butter cups or any type of candy he goes nuts and will eat that. I know it is bad for him…yes we have checked his insulin levels also. It kills me as I am having to force feed him and he dreads it. HELP…ANY IDEAS AND SUGGESTIONS ARE GREATLY APPRECIATED. He was a rescue that had 19 Chihuahuas. They started with 2 and they kept repopulating, so I feel he is extremely inbred. 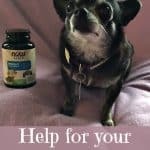 Have you tried Royal Canin for chihuahuas? Most chis LOVE this stuff. You could also try adding a few drops of honey to his food since he has a fondness for sweets. I Need help my dog Scrappy is big 24 pounds when he should be six to eight and I have been walking with him every day. even long walks and playing with him but he keeps gaining weight now. I live in a house where there are twelve dogs. One got put down recently for being 16. He had a heart murmur but his body condition was fine. The oldest is skinny too. there are only two big ones. the only thing is that every day at supper. They all get around 7 to ten pieces of whatever we had for dinner. but with the exercise, my dog started gaining weight. plus my brother stepped on his leg two times today so now he is limping. What should I do when he heals.He is only thirteen years old and I can’t control his food. Because every time I turn around someone is giving him food. Also, the other big dog got his leg stepped on yesterday by my mom’s friend so we have to big dog limping. I have this problem too with my Kilo with other family members giving her treats all the time. So I don’t know what to tell you about handling that situation. Is there any way you could take over Scrappy’s feedings and feed him separately from the other dogs? When his foot feels better I’d try to find away to get him moving around more, such as playing games with him or taking him on walks. I don’t think the exercise is causing the weight gain. All it will do is increase the muscle mass, which is a good thing. It’s possible too that he may have a thyroid condition causing (or maybe just contributing to ) the weight gain, but most likely he’s getting fed the same amount as the big dogs. She’s a medical alert dog and later this summer we will be getting another dog for her to help train so we can retire her in the next 18 or so months. She deserves to be a “lady of leisure”! The attached photo was taken two weeks ago, we’re getting ready to go to Arizona by train and while a service vested isn’t normally needed, Amtrak said she needed something to identify her as a service dog, so I complied and got her a new vest, her old one was getting tacky looking and she didn’t wear it. I’d say she looks pretty good for being almost 11 years old! Darn, the photo didn’t come through Krystal. It worked that time. She’s such a cutie! My Chihuahua should weigh 6 lbs, I feed him 1/2 cup a day of grain free food, and he has gotten FAT. But sites say feed him 230 calories a day.. Uh that is 2/3rd cup of his food! He would get even fatter! All he gets outside of that is a milkbone treat in morning he doesn’t even really like, just eats it when the other dogs want it. And its a small one.. So, I don’t trust these sites about calorie amounts. NO HUMAN FOOD, no scraps, nothing but VERY rare, like once every couple weeks.. so what makes him so fat? I think the 230 calories is for the average young adult dog who is getting plenty of exercise. Has he been checked by a vet for thyroid issues? It could be that or he could just have a slow metabolism. If he doesn’t like the milkbone treat, I’d cut it out or at least, cut it in half. How much exercise is he getting? I’d try a daily walk if he isn’t getting one. I know that helped my Kilo when she put on weight. My Chi Jewels is very overweight she has been overweight for a while now and we just cant get her to eat dry dog food! 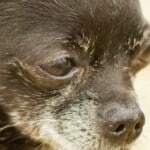 I want my Chi to be healthy and live forver but i dont know what to do…please help. My Chi is also now agressive with other dogs and agressive towars me and my family members sometimes but she was very good with other dogs and people when we first got her… do you think her new attitude is because of her weight? Also when we turn the microwave on and its go off she goes CRAZY do you know why this is? Jewels doesn’t have to have dry dog food. You can five her a good quality canned food or better yet, give her Fresh Pet (it comes in a roll, like a sausage roll package). Just don’t over feed her. Has she been checked for thyroid issues? That could cause the weight gain and the personality changes too. If not, get her checked. It usually can be easily treated with a daily pill. The microwave thing, the only thing I can think of is maybe the high pitched sound of the bell ringing scares her or hurts her ears. Can you take him for a walk? If so, that’s a great way to get some exercise. How many times a day is he getting that 1 spoonful of wet food?